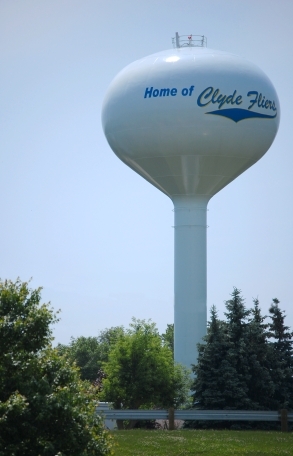 Design capacity for the Clyde Water Treatment Plant is 2.4 million gallons per day. The plant contains treatment and pumping facilities, water quality laboratory and administrative offices. Water for treatment is stored in Beaver Creek and Raccoon Creek Reservoirs. Potassium permanganate or powdered activated carbon may be added to the water in the pretreatment tanks to combat taste and odor problems. The rapid (flash) mix tanks are for dispersion of ferric chloride into the water. The flocculation (mixing) tanks are for coagulation to develop a floc and for softening the water. The sedimentation tanks are for clarification of the treated water by slowing down the flow to allow the opportunity for floc and softening precipitate to settle as sludge on the tank bottom. Mechanical sludge scrapers are provided for sludge removal. The filters are for removal of unsettle able floc and precipitate. The clear wells are for disinfecting and storage of treated water. Chlorine, for disinfecting, is added to the water as it leaves the filters. Fluoride, for OEPA regulation compliance, is added to the water. The high service pumps deliver the potable water to the distribution system. The laboratory enables the city to routinely test the water before, during and following treatment before it enters the distribution system and to test water samples taken from the distribution systems and customer plumbing.